Last edited by GateWorld; November 21st, 2018 at 09:51 PM. I never trusted Amazon anyway. "You don't know half of it". This was my favorite of this season yet, so far anyway. Good old fashioned puzzle for the Doctor to solve. Shame they killed off Kira. I understand why they did it, narratively speaking, but the actress had a 'companion quality' to her in the vein of 'Lynda with a Y' or Sally Sparrow. Also, hello... and I'd like the Doctor to pop over and give that brilliant management-speech to my teamlead. She seriously needs to be told those exact words. Great Episode. Good that we are getting there. Am I the only one questioning the Doctors moral here? I mean its one thing to let the baddie blow up in his own trap, but imo she effectively killed or at least greatly damaged the innocent calling for help. It was the system itself, that called her to help. Her reaction in turn was to blow up a big portion of the systems population. Job well done? Doesnt quite feel that way. This has probably been the worst season of DW reboot so far. There's no real jeopardy, the Doctor's not been severely tested yet nor had any extremely difficult decisions to make, I'm not emotional invested in any of the characters yet, there's no mystery or new insight revealed. She asked Twirly for help in turn when Charlie activated the deliverers to teleport to their customers. It was the system, in the end, the way I see it, which blew itself up -- or at least the Kerblam men. They saved the customers' lives by delivering to themselves instead and popping the bubble wrap. And she did try to save Charlie, but he didn't want to be saved. He had time to return when Graham called out to him, and it wasn't until Graham told the Doctor to get them out of there, that she activated the teleport. The system held back the kerblam men as defective circuits that were a threat to others. Unlike say DATA who is an autonomous, contained system, the Kerblam AI is a widespread intelligence that the loss of even thousands of drone hosts is nothing. Indeed, the fact that spinny so readily complied with the Doctors suggestions tells us it KNEW that, and it was the best course of action under the circumstances. 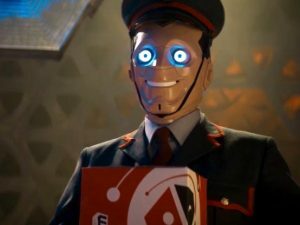 I used to work for Amazon, and I was sitting watching, mentally ticking off all the similarities. Colour coded hi-vis vests for different jobs? Check. Managers spouting nothing but corporate clichés and buzzwords? Check. Not being allowed to talk to your mates or more than a couple of minutes outwith break times? Check. Conveyor belts whizzing all over the place? Check. I had this mental image of Amazon's head honcho, Jeff Bezos, sitting in his underground lair, stroking his white Persian cat, and saying to himself "Ankle monitors? Hmmm... Now why didn't I think of that?" The only thing that bugged me, was how slowly the packers were going. I used to do that job (among many others), and if I had been going that slow I'd probably have been either moved to another job or fired. Last time I checked, the hourly target for Single Item Pack was 100 items per hour. LOL, I was thinking the same thing -- they would not have made it through day one at Nike. Any speculation as to where Ryan worked? There isn't an Amazon warehouse in Sheffield. Another thing I felt like really relatable this episode, other than the Doctor just completely channeling all of me, the idea that she couldn't sit on the conveyer belt... COME ON!! Not cool! The horror stories I've heard about Sports Direct warehouses, they make Amazon look like a holiday camp by comparison. But I was thinking, this episode has one of the simplest Doctor Who related cosplays ever. Your normal street clothes, plus a hi-vis vest with the Kablam logo on the back. Indeed, but I would still go for a Kerblam!-man. Wouldn't mind a radio controlled Twirly. I'd rather work for Kerblam! than Sports Direct. Order picking -- I've got some experience in that. Packing, rather not. Pick and Stow are about the only two jobs I haven't done in Amazon. Can't do them because it'd involve me getting stuff from locations at ground level, I've got bad knees and I kneel down for anything there's no guarantees I'd be able to get back up again without help. I've done Receive (hated it, could never make my targets), Single Pack, Multi Pack, Bundler, and Shipping. Shipping was easily my favourite, no targets to meet, just putting the boxes into the back of a trailer.